Dinner at Guu! Woohoo! However, it’s only the one at Aberdeen, and I think that one has a reputation for not being up to par with the Downtown ones. However, this was back at the time before the Canada Line was finished, we didn’t want to go drive all the way there, we settled for the Richmond location. Maybe due to the fact I didn’t have high expectations, things were actually not bad. 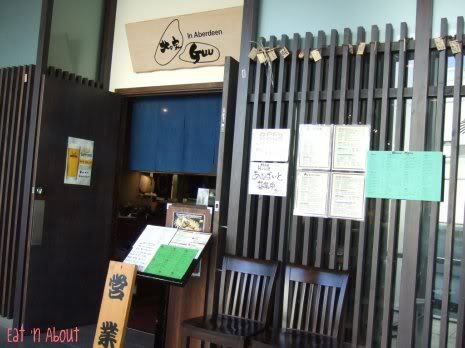 First up, ordered a few things we always order at “original” Guu (I consider the Thurlow location the original, and this location has the same menu as that one). The Beef Sashimi was good as always. The meat was tender and not chewy. The vinagrette was tangy and tasty. A good start. The Pumpkin Croquette is a must-order of mine. It’s really nothing special but I really like it, it’s simple and always done well. 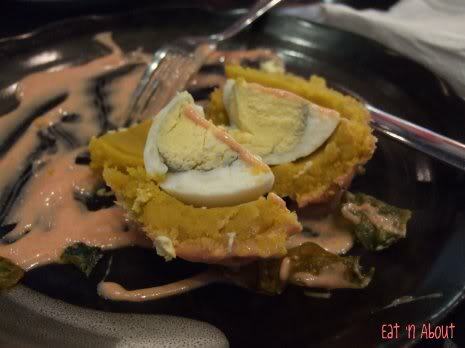 The pumpkin mash was slightly sweet and goes well with the mayonnaise sauce that tastes like thousand island dressing. Next is supposed to be a regular too, except it wasn’t. The Salmon Tataki dish that we used to order at the Thurlow location has the sashimi pieces cubed and served with nori and raw quail egg. This was similar but it just wasn’t the same. I like the old one better. 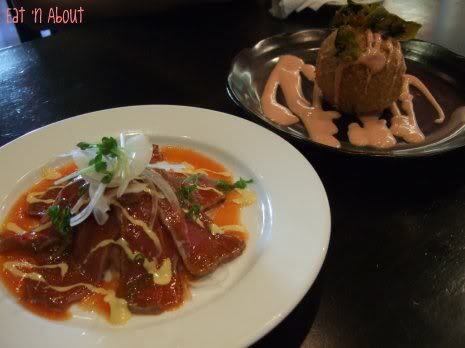 This is another tataki that Pretty Sister is very fond of. She prefers tuna over salmon so we always get both. This was served three ways but honestly it really wasn’t that special either. I always found tuna to be quite tasteless. From the left, the first dipper is just deep-fried garlic flakes, then it’s a sweet chili sauce, and to the right is just some salt and pepper. At the front is some sesame sauce I think, I don’t quite remember as I didn’t use it. Next is something else PS ordered. 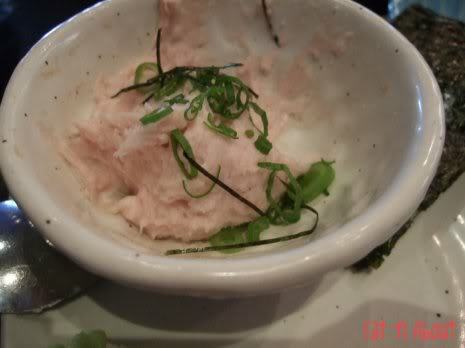 I think it’s like a Negitoro sashimi type thing but to me it was like a mousse. It was much too soft. I really didn’t like this. Again it was tasteless. Then this is something interesting I ordered from the Daily Specials menu. 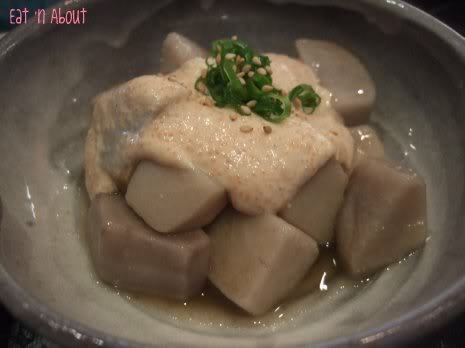 It’s simply “Stewed taroyam w/ Cod Roe Mayo”. If you’ve read my Ichiro posts you’ll know that I love the slimy nature of yamakake. Not knowing exactly how this dish would look like, I really hoped it’ll have it. And it did. Although not as much as I’d hoped. However, as simple as this looks, it was simply delicious. It was serve cold, but the taro was really soft and flavorful. The mayo added a richness to this and surprisingly this was quickly gobbled up by all parties. This was Boyfriend’s choice as he just simply loves Unagi-don. 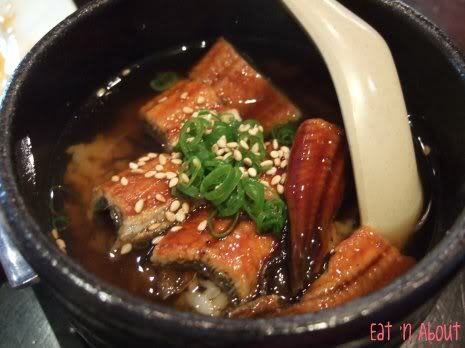 Guu’s version is the Unagi-don served with “tea”. 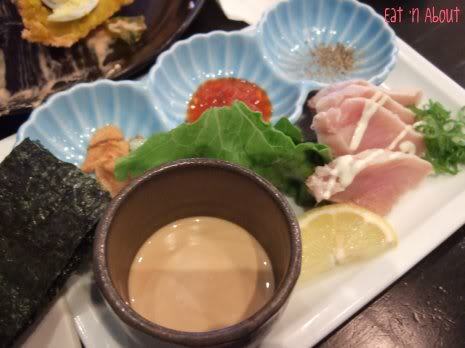 At first when he ordered it I was skeptical as I didn’t really know if it was really tea, thereby blanding out the dish. However when it arrived I took a sip and it’s actually a clear, salted broth, so it was alright. It was a bit small though but I think he enjoyed it. 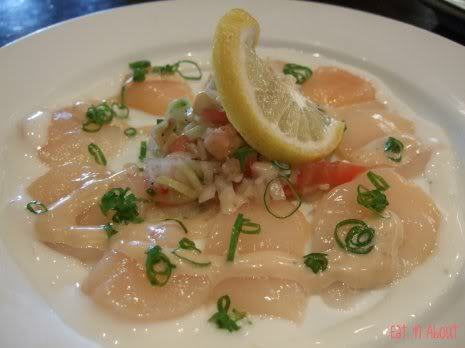 The Scallop sashimi was sweet and fresh, and there were quite an amount of it. Because of the mayo-type sauce this didn’t need any soy sauce. However, I think this was too rich for me as scallop sashimi itself tend to be, but I did enjoy it. 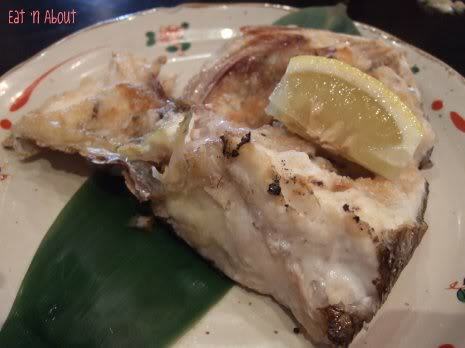 Lastly, to finish off the night, we ordered one of their recommendations which was simply a Salt-grilled Fish head, as for what kind of fish, I really don’t remember. It was done well but could’ve been a bit more moist. This was kind of expensive too though, something like $10. I expected more from the $10 but this was all. I may not order this again. Hi Wendy, the salmon with quail egg is actually the Salmon Yuke. I love that dish. 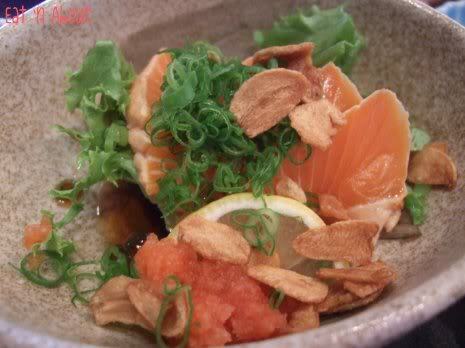 Salmon Tataki is cooked slightly on the outside, then sliced. I personally think Beef Yuke is even better! I went here a couple weeks, I’m going to be writing my review for it too. The pumpkin croquette I wrote the same as you almost – tastes just like thousand island dressing. I don’t like how they pre make them though and have them sitting there.